It finally hit me last night just how lonely I still feel, one and a half years on since I wrote my post about the unexpected loneliness of becoming a mother. During this past year and a half I've had to concern myself with trying to over my depression and crippling anxiety, looking back now I realise how terribly bad I was and I had no one to help me through but myself, whilst also looking after my son almost single-handedly. I had to get better not only for myself but for my son too, he needs a happy, healthy mother... but these feelings of loneliness just won't go away and they have eaten into my heart and spirit with such force that I can't pretend that I'm not craving the company and attention of someone, anyone, anymore. I now make the effort to get out of the house everyday, occupying my time with my budding passion for photography and trying to capture the beauty of the world around me, however, there is always a sadness in my heart when I return home, all I have for company is the computer and all the people in the virtual world on the other side of its screen. I have my son, of course, but he cannot yet talk and there are days when I just lust after some adult conversation, some laughs and banter, a chance to actually be listened to and feel that I at least have a friend in this world... sadly, this doesn't happen often. I have three friends who are all very busy ladies and if I'm honest I don't like to bother them when I know just how busy they are. I've lost my two best friends since I had my son and even if I say that 'it doesn't matter, it's just what happens when people get older', it still bloody hurts, a lot. I'm twenty-five and I'm lonely and sadly, I think I'm far too old to go out and try to meet new friends - there are no people in the places I go, the meadows, fields and beaches of my island and surrounding areas aren't exactly jam-packed with potential friends, and I guess I do like the solitude but sometimes it all becomes too much, like today. My phone never rings, I don't get any texts, no one calls to my house except my stepdad when he's in need of a chat... I'm always there for people to speak to when they need to, but who's there for me? 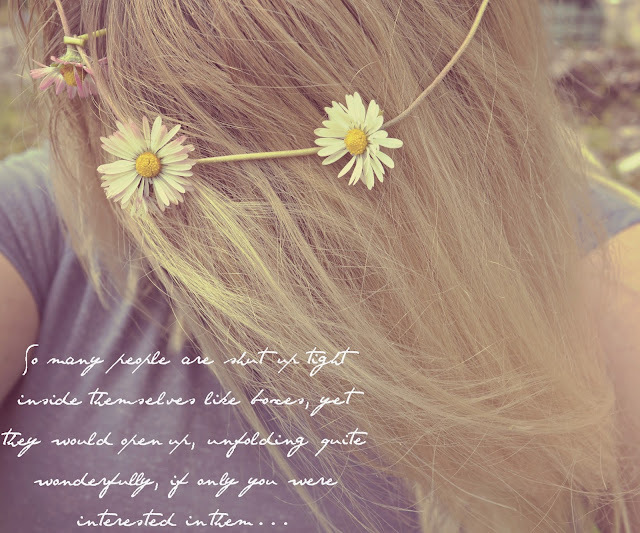 As I sat today amongst the daisies, making daisy chains like I did during my schooldays and admiring the beauty around me, the sun shining warmly on my face, I had to think back and wonder where it all went wrong for me. I used to be such an outgoing child, one who loved to speak to people and make new friends but that girl is no more, instead she is lost in solitude and has only her own, cheerful son to pass the days by with. Sorry to hear this Fiona. You're one of the most caring, thoughtful people that I know and your friends are very lucky to have you in their lives. I know that after having my kids, my group of friends got smaller too and it does hurt. Sometimes people do grow apart or one person is making all the effort, it's not your fault. Hugs, Fiona! I know loneliness too. My husband died in his sleep Nov. 2013. Some days it really is crippling. It helps that I have my kids at home still and it will help when your little guy starts talking. He is communicating though :) Just hug him and keep taking your beautiful pictures! I totally understand you! I have had those moments when I felt really lonely after I had my son. I can relate. I ended up joining a moms group in my town when my oldest was 2 and it was one of the best things I have ever done. I met a bunch of moms in my town (that I was new to) and I still see these same moms around town & our kids have grown up together. You should see if there is something like that near you. I found that my new mom friends totally got what I was going through and it helped me a lot with that lonely feeling. I feel the same way. I don't have children but I have two dogs and at times I wish they could talk back to me. Yes I am married, yes my husband is my best friend but what happens when he works all weekend and I cannot see him? I do have friends, but those friends never really invite me out places or want to hang out because their husbands are home and sow times I envy them but I stay home, watching Netflix which I have pretty much watched every show on and curled up on the couch stuffing my face. I totally get it! Oh Fiona, only just read this. I'm sorry you are feeling this way. I think we all do from time to time - especially in this busy world we live in. Maybe you and your partner need some quality time together, me and Jamie are so guilty of just doing our daily routine and forgetting about the people we were before we became parents. It's nice to have some set time to re-connect. I think we all have felt lonely. However, if there's one thing I know the things we experience in life aren't just for us. And I say the best way to get over it is to find someone to minister to. As you can see there are tons of women who have felt just what your feeling. They need you just as much as you need them. Start a support group and reach out. You will be surprised how much that will help you in the process. I experience this same feeling. Getting a job working from home has helped but there are still just emails not real life conversation. I would see if there is a playgroup to join up with, its not to late in life to make new friends. i can definitely relate to your feelings of loneliness. even though it seems like we're having such a grand old time moving from city to city and having lots of local adventures, it can be very lonely without community and being without our friends and family. and even though my husband loves me the best way he knows how, often times he doesn't understand my struggles, so it can feel very lonely too. i'm 32 in a new city feeling like i am too old to make friends, but i don't think that is the case. i'm not exactly outgoing, so it's hard for me to want to make new friends.. but i hope we both find the courage and push ourselves to do just that. :) at the very least, i've found that although we move from place to place, i've made many friends through blogging that have been supportive. Oh you know what, I totally get this. I felt this way with my first son until my husband told me to join a mom's group. I think that is totally what you need. My reccomendation is to find one in your area. When I did, it helped to combat that loneliness and I learned to connect and make friends with other moms I knew felt just like I did from time to time. I think that is what you need. This feeling of loneliness I think we all go through one time or anther in our lives. I was so feeling the loneliest about not to long ago but found so amazing friends on line to bring me out of the hole I was in for sure. Hope you feel better soon and remember this to shall pass. Thanks for sharing. Sorry to hear about this today and think we all at sometime in our lives feel lonely! I always think the best think to do is to reach out and help someone else taking the focus away from ourselves and hope you feel better soon! oh God Fiona i absolutly understands you. i am really sorry that u feel this way.Unfrotunattly lonliness is the hardest thing to live with. Ughhhh I totally relate!!! Unfortunately for me, I'm not even that old... 32... Well most of the moms here in WNY ate about 10 years younger than me lol.... So the whole mom friends thing doesn't work very well :-/ and my daughter hardly speaks.... Hubby works 60+ hours a week.... Ughhh lol... You're not alone! Though I can't relate to the single mother part I can certainly relate to the loneliness part. I too was like you an outgoing child who made friends easily, now my so called friends are always busy and we never have time for each other my one friend who does is million miles away on the other side of the world. Loneliness is the worst feeling in the world I feel you.